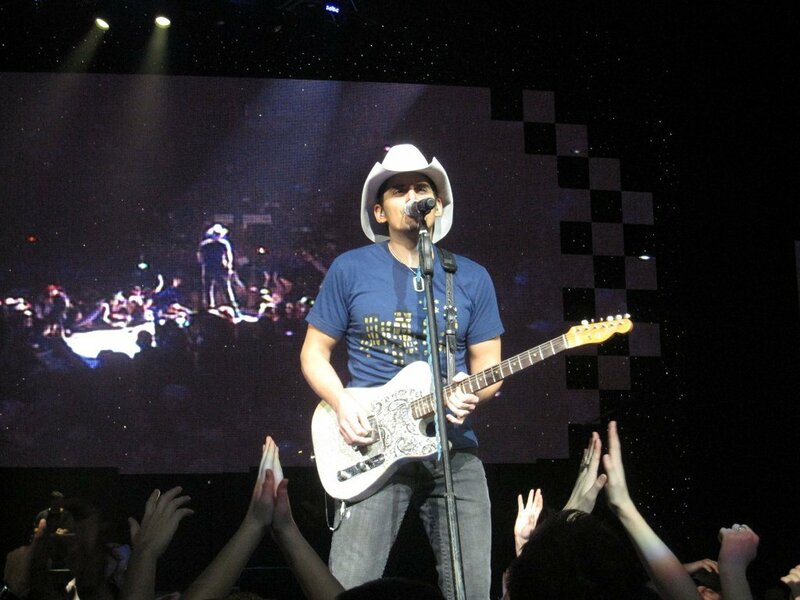 Brad Paisley, current reigning CMA Entertainer of the year, took Montreal by storm at the Bell Centre on Saturday, January 29. In his own words, he was not expecting so many fans to actually come to the show. Truth is his arrival was long overdue and eagerly expected. The country singer was overwhelmed by the response, and the fans did not let up one bit. Barely coming up for air, Brad went through his extensive repertoire of hits without having one song not being sung back to him. Everyone was familiar with all of his songs, both old and new. Along for the ride he was in excellent company of his two opening acts. Jerrod Niemann and Darius Rucker. Darius even sung some of his old hits when he was a part of Hootie and the Blowfish, and did one excellent rendion of Purple Rain. The expectations for Brad were considerable, but he blew them out of the water the monemt he came out. He literally appeared to come out of a pool in the giant screen. Whether you were a fan of Brad’s earlier work or his latest, you were not going to come out disappointed. Brad covered the new hits like Water, American Saturday Night, Welcome to the Future, as well as going through Online, A Letter To Me, Then, I’m Gonna Miss Her all the way to Waiting On A Woman, Whiskey Lullaby and Mud On The Tires. The stage had tree corridors running into the crowd and I was lucky enough to have nabbed a spot a few seats from the central one. He went around the stage until the point he would even walk off it. Then he literally did that, walking all the way to the back to a makeshift stage where he performed a couple of hits. Sound familiar? Taylor Swift was once Brad’s opening act. I’m not trying to take anything away here – you are supposed to learn from the headliner. For certain performances, Brad uses a track to be able to sing with some famous people in the background. Waiting On A Woman has a video of Andy Griffith as the old man in the song that gives Brad Advice. At the end of the performance, Brad even climbs along the screen to wave him goodbye. It was a very moving moment. 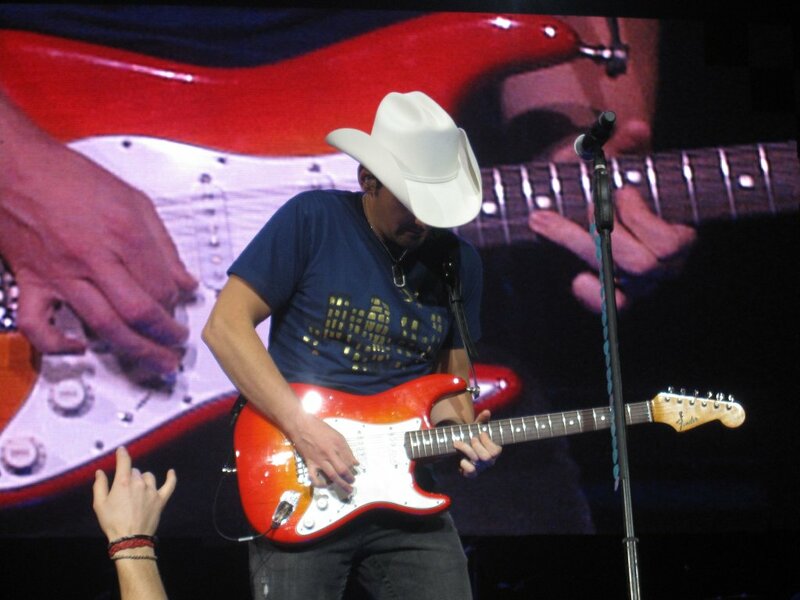 Another time he used a track is during Whiskey Lullaby. It’s him singing it, but Diana Krall comes in via a recorded video performance. I don’t have to mention she’s from British Columbia, Canada. The crowd went wild. Brad very much tailored a couple of things for the crowd. During a very moving performance of his latest single, This Is Country Music, the American Banner appeared on the screen. Then the Canadian Leaf appeared just over it. It’s a detail, as well as a few others that would appear from time to time, but they show you know where you are. It’s very hard to pick a favorite performance, but if you go by crowd response you’d still end up with at least a dozen songs. I’m Still A Guy was roared by everyone in the audience. Mud On The Tires was celebrated more than it was sung. Then took everyone’s breath away. I can’t avoid mentioning Catch All The Fish, Drink All The Beer and I’m Gonna Miss Her. The closing act was Alcohol which had everyone out of their seats. Brad is a singer, a show man, a prankster and most important, the man is a class act. Fans of both old and new country music will be pleasantly surprised. A most memorable night, and one of the best concert experiences you’ll ever had. Can’t recommend his show enough. Catch it all when you can. Brad didn’t need to change things too much to appeal to the crowd. Everyone in the audience was quite at home with his flavor of north american lifestyle. Canadians and Americans have more things in common than different (getting either side to admit that is a completely different thing). But based on Brad’s performance and the audience response I think we can agree that Country music is one thing we’ll be glad to share. Okey… Alcohol. Make that two things. More pictures of the concert in the Gallery. February 4: Tickets go on sale to the general public for Newark, New Jersey at Prudential Center. February 4: Tickets go on sale to the general public for Washington D. C. at Verizon Center. February 4: Tickets go on sale to the general public for St. Louis, Missouri at Scottrade Center. February 4: Tickets go on sale to the general public for Nashville, Tennessee at Bridgestone Arena. February 9: Speak Now tour in Singapore, Singapore at the Singapore Indoor Stadium. Click here for ticket info. February 11: Tickets go on sale to the general public for Kansas City, Missouri at Arrowhead Stadium. February 11: Speak Now tour in Seoul, South Korea at the Gymnastic Gymnasium. Click here for ticket info.